Located in the heart of The Cosmopolitan, a new ultra-hip and swanky cocktail lounge adds another dimension to the resort’s dynamic bar collection. CliQue Bar & Lounge serves as an escape from the outside world, offering artisanal cocktails and house-made mixers. CliQue Bar & Lounge is adorned with dark wood, comfortable couches and posh finishing touches that create a lavish ambiance. 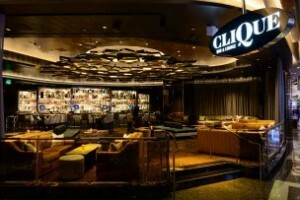 Mixology from the minds of the most innovative bartenders, Mike Monreal and Justin D’Angelo, take center stage as CliQue Bar & Lounge reinvents the lounge experience with tableside mixology. 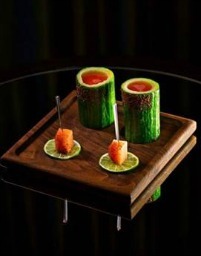 Aside from classic drinks, CliQue Bar & Lounge offers a one-of-a-kind cocktail menu with fresh juices and garnishes.